Prosecutors in southern California have charged a Saudi Arabian princess with human trafficking and accused her of bringing a Kenyan woman to the United States and holding her against her will as a servant. 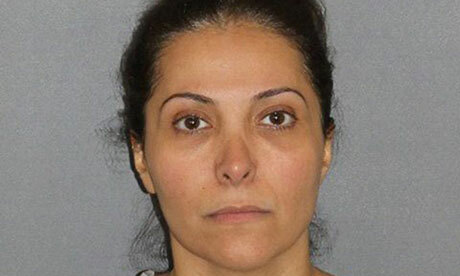 The accused woman, Meshael Alayban, 42, brought the Kenyan to the US in May and paid her $220 a month while holding her passport and keeping her confined to an apartment complex in Irvine, California, where Alayban lived, Orange county prosecutors said. The servant, whose name was not released, had to wash dishes, cook, clean, do laundry and iron without a day off, prosecutors said. Authorities said they found four Filipino women in the home who also may have had their passports seized by Alayban’s family. An investigation was under way into whether others were involved in the alleged human trafficking scheme. Police arrested Alayban early on Wednesday at her apartment, a day after the Kenyan woman escaped and flagged down a bus driver, the statement said. Alayban is charged with one felony count of human trafficking. The only occasion when the Kenyan woman was allowed to leave the Irvine apartment complex was when she carried the bags of Alayban’s family during an outing, prosecutors said. The Kenyan also attended to other people linked to Alayban who lived in the same complex, according to the statement. Alayban had first hired the Kenyan woman as a domestic servant in March 2012 in Saudi Arabia in her family’s palace, prosecutors said. She is accused of holding the woman’s passport then as well and forcing her to work every day for 16 hours. Orange county prosecutors said the Kenyan woman originally came to work for Alayban by signing a two-year contract with an employment agency that promised her $1,600 a month to labour for eight hours a day, five days a week. Alayban is a wife of Saudi Arabian Prince Abdulrahman bin Nasser bin Abdulaziz al Saud, according to the Orange county prosecutors. Alayban’s attorney, Paul Meyer, said “the complaints were about hours worked and wages paid”. “We intend to fully investigate this matter, and expect that the truth will resolve it,” he said. Alayban appeared in court in Orange county on Wednesday and a judge set her bail at $5m. She remained in custody at a women’s jail, the Orange county sheriff’s department said. Alayban faces up to 12 years in prison if convicted.